Byzantine, Texas: SVS Press launches "Coptic Studies Series"
SVS Press launches "Coptic Studies Series"
(SVS) - St. Vladimir's Seminary Press (SVS Press), the publishing house of St. Vladimir's Orthodox Theological Seminary, has launched a new series highlighting the history and spirituality of the ancient Coptic Orthodox Church. The first book in the "Coptic Studies Series," titled, The Life of Repentance and Purity, was authored by His Holiness Pope Shenouda III and is scheduled for release by December 2015. His Grace Anba Suriel (Guirgis), bishop of the Coptic Diocese of Melbourne and Affiliated Regions, Australia, who studied at St. Vladimir's from 1998–1999, is Series Editor for the new line of books. Pope Shenouda's book was first translated from Arabic in 1989 by Bishop Suriel and was published in 1991 by the Coptic Orthodox Publication and Translation Committee in Sydney. The new translation, also by Bishop Suriel, will include editions and patristic references and will be a joint publication between SVS Press and St. Athanasius Press, the fledgling publishing house of St. Athanasius Coptic Orthodox Theological College in Donvale, Australia, where His Grace acts as Dean. "This is a big step for us," noted Bishop Suriel. "Being in cooperation with SVS Press, which is well known around the world—even outside of Orthodox circles—will provide more recognition of our own theological press. "I am deeply indebted to Father Athanasius Farag, Father Bishoy Lamie, Phoebe Farag, and several others who worked tirelessly to prepare the manuscript that was presented to SVS Press," he continued. "I am also grateful to Father John Behr, dean of St. Vladimir's, and to Michael Soroka and Dn. Gregory Hatrak, who are employed at SVS Press, for their hard work in assisting in bringing this work to light once more—in a much better edition! "We hope to be able to publish more works in the future, especially with the new series, which we are very excited about," he said. "We want not only to raise the profile of our school but also to emphasize the importance of Coptic studies." One of the titles that His Grace will propose for the "Coptic Studies Series" is a book about the life and work of Archdeacon Habib Girgis, former dean of the Coptic Seminary in Cairo, Egypt, who was recently canonized by the Coptic Orthodox Church. St. Habib Girgis greatly influenced the Coptic community by urging its members to develop educational curricula that would revitalize their faith, which in the early 20th century was being challenged by foreign missionaries. 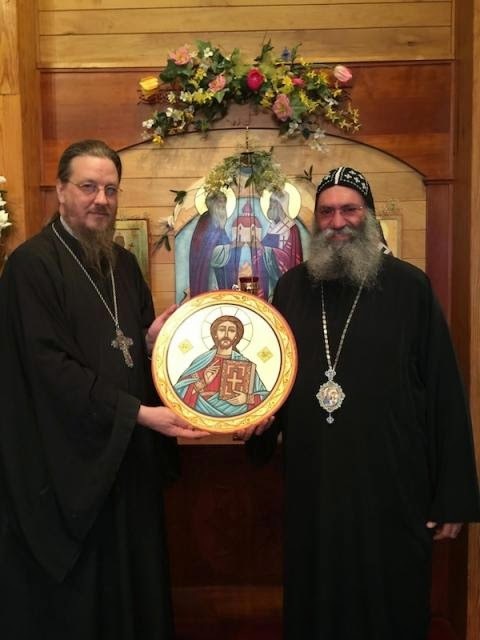 "The ties between St. Vladimir's Seminary and St. Athanasius Coptic Orthodox Theological College have been strengthening during the past few years," acknowledged Fr. John Behr. "Both Bishop Suriel and I, as the Deans of two theological institutions—who also happen to be close friends—highly value theological education and acknowledge the importance of rapprochement between the Oriental and Eastern Orthodox traditions in the 21st century." In 2013 Bishop Suriel hosted Fr. John during an eventful trip to Egypt, where he was guest of His Holiness Pope Tawadros II of Alexandria. During his visit Fr. John delivered a paper titled, "Orthodox Theological Education in the Twenty-First Century," at the "Theological and Ecclesiastical Institutes Seminar," which explored the spiritual formation of theological students. Held at the Anaphora Institute, a retreat and training center near the desert road between Cairo and Alexandria, the seminar featured talks by eminent Coptic bishops, clergy, and scholars. Bishop Suriel visited St. Vladimir's campus in 2013, at which time he met with Fr. John Behr to discuss greater collaborative efforts between the two theological schools, including exchanges of students and faculty. As a result Fr. John, professor of Patristics at St. Vladimir's and globally renowned in his field, will be teaching a Patristics course at St. Athanasius in the fall of 2015. Further into the future, both deans envision a Coptic House of Studies on the Yonkers campus, at which faculty from the Coptic Church may provide special liturgical and pastoral formation to students from that tradition. Bishop Suriel was featured in The SVS Vine: Annual Report FY 2014, which included a video of his plea for prayer for persecuted Coptic Christians. Didn't Pope Shenouda also author a pamphlet I Christology which was straight monothelytism? His theological writings were the worst. If you are from a church where people are eastern, wear beards and eat a Mediterranean diet... maybe they'll publish you. Who really cares about the Seven Ecumenical Councils and the sayings of God-bearing Saints this point?